Mitt Romney doesn't want to talk about FEMA anymore. Of course, he doesn't. What he wants to do is very unpopular, especially at times like this, because it would benefit only a very, very few. He wants to downsize FEMA (the Federal Emergency Management Agency) and outsource it, make those ever-more-frequent weather disasters into another profit-making opportunity for the 1 percent, which of course means that it wouldn't work very well, if at all, especially not for the 47 percent that it's not his job to think about. Romney, Ryan, and the rest of the Drown-Government-in-a-Bathtub folks don't believe in FEMA. To them, natural disasters like the one we experienced this week are just a way to reduce the surplus population. They don't have a stake in what happens to anyone else. Their only stake is what happens to themselves and maybe a few of their cronies. What they don't understand—refuse to understand—is that living in a civilized society has to mean that we have have a vested interest in what happens to each other. It means acknowledging that your well-being, or lack of it, affects me, and that I'm willing to invest in our collective well-being. Because we all do better when we all do better. Our communal well-being compounds our individual well-being, and our individual well-being depends on our communal well-being. The plundering plutocrats and corporate kleptocrats among us believe that their well-being is separate from and paramount to ours. They believe that having so much means that they deserve more. They think somehow they can horde it, like a mound of jewels in a dragon's den, and that somehow continually adding to their collection will enhance their well-being. But just like the junkies that they are, they can never get enough, and the more they get, the more they want. They will never be satisfied. I'd been a racketeering and fraud investigator for twenty years already when I jumped into the investigation of the Kochs. Koch's motive for the skim was obvious: he wanted the money. But, for me, this was a new level of weird. Why in the world would Charles Koch, then worth about $2 billion, want to take three dollars from some poor Indian lady? It even puzzled his own henchmen. Roger Williams asked Koch, who was literally giggling over the amount of "overage" he'd pocketed, why the billionaire bothered to filch pocket change from Osage families. "I want my fair share—and that's all of it. This plundering pirate actually believes he is entitled to all of it. That his fair share is all of it. Just cuz. Talk about "entitlements"! Imagine for a moment, if you will, that you live in a smallish village of humans, and it's the only such village anywhere. And surrounding your village are wild animals that occasionally attack your cattle and the cattle that belong to some of your neighbors. And occasionally a storm will blow through and damage some but not all of the crops. Now imagine a village meeting in which you all discuss what's to be done about these threats to the well-being of some of the villagers. Will it be only the ones whose crops and cattle have been harmed that advocate for a collective response to help prevent and mitigate future damage? Will there be a wealthy villager who, having built high walls around her crops and cattle, refuses to invest in the protection of the crops and cattle of others? Will that wealthy one refuse to see that her well-being depends on the well-being of the village? That if the rest of the village does not thrive, there will be fewer able to purchase the wealthy one's produce? If so, how will the rest of the village respond to the wealthy one's recalcitrance? Maybe pass a law that requires that all contribute, whether they want to or not? Of course, reality is seldom quite so simple, but nonetheless we are the global village. And some think that their well-being is independent of and superior to that of the rest of us. But they could not be more wrong. When it comes to our precious and fragile planet, when it comes to the dangers we all face—to our health, to our environment, to our civil liberties—we really are all in this together. That's what FEMA means, ultimately. When a ginormous hurricane pummels the East Coast, those of us in Wisconsin know that we are not unaffected, even though all we get here of the storm itself are a few gusty winds. We know that our well-being depends on the speedy recovery of those whose lives and livelihoods have been damaged by the storm. We are in this together. That's why we have a federal government and why we have FEMA. And that's why Romney doesn't want to talk about it. Because he's that one person who believes that his well-being is more important than that of others, and he knows that's not going to play very well with the rest of the village. Some good folks on the left of the political spectrum, many of whom I respect very much, dismiss the notion of voting for the lesser of two evils. Certainly doing so can be disheartening and demoralizing. It can feel like there's little real choice involved. When do we get to say what we really need, register our outrage at what offends us so deeply? But in these evil times, in this corrupt winner-take-all political system of ours, pragmatism points to just such a choice. I appreciate that many women, families, and workers will likely do better with Obama in office for another four years. But given the drones, the war in Afghanistan, the NDAA, the record number of deportations, I cannot bring myself to vote for Obama. In other words, I am not "in." On the other hand, I will not miss the opportunity to vote against Mitt "Corporations-Are-People-My-Friend" Romney. Romney is so saturated with privilege that he thinks the American people should vote for him and his so-called five-point plan without him divulging any details or offering any substance to indicate that the math might actually add up. (It doesn't.) We're supposed to just trust him. (*eyeroll*) He's so truth-challenged that he doesn't seem to know the difference between truth and lies. And far worse, he doesn't seem to care. 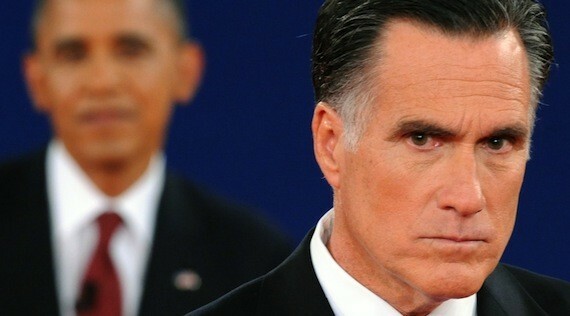 Romney treats the American people ("you people") with only the most thinly veiled contempt. He seems to think he's entitled to the presidency, and he's willing to do anything and say anything to make sure he gets it. I can't imagine a more dangerous creature for our people or for the planet. Someone so morally bankrupt should absolutely not be allowed to choose the next two or three members of the Supreme Court, not to mention commanding the most powerful military force the Earth has ever known. The election is at this moment a toss-up. That means this is one of the uncommon occasions when we progressives—a small minority of the electorate—could actually have a significant influence on the outcome of a national election, swinging it one way or the other. The only way for progressives and Democrats to block Romney from office, at this date, is to persuade enough people in swing states to vote for Obama: not stay home, or vote for someone else. And that has to include, in those states, progressives and disillusioned liberals who are at this moment inclined not to vote at all or to vote for a third-party candidate (because like me they've been not just disappointed but disgusted and enraged by much of what Obama has done in the last four years and will probably keep doing). They have to be persuaded to vote, and to vote in a battleground state for Obama, not anyone else, despite the terrible flaws of the less-bad candidate, the incumbent. That's not easy. As I see it, that's precisely the "effort" Noam is referring to as worth expending right now to prevent the Republicans' rise to power. And it will take progressives—some of you reading this, I hope—to make that effort of persuasion effectively. As disastrous as eight years of Dubya were, a Romney presidency would be even worse, in part because it would add to the damage Dubya did that has not yet been mitigated. And as deplorable as many aspects of Obama's presidency have been, a Romney presidency would be much worse, even catastrophically worse, as Ellsberg says. A Romney presidency would greatly hasten our slide toward all-out corporate kleptocracy and modern-day feudalism. More privilege for the privileged. More austerity and suffering for everyone else. In a little more than two weeks, I will be voting enthusiastically for Tammy Baldwin to be my senator and for Mark Pocan to be my representative. And as for that other race, as I draw a line next to Obama's name, the enthusiasm involved will be in my wholehearted desire to prevent the greater of two evils. As an ever-more-deeply-invested participant in the Solidarity Sing Along, I've been thinking lately about why we sing, why we've chosen this particular form of expression. Just what's going on here? Why do we keep coming back? What exactly are we accomplishing? I don't think of what we do as protest, because it's so much more than that. Certainly there are plenty of things going on in our state worthy of protest. But our singing is also a communal affirmation of our hopes, our values, our longing for justice, truth, and democracy. Communal singing is a vital part of building social movements: the civil rights movement, the labor movement, the Singing Revolution in Estonia, the effort to end apartheid in South Africa. Building and re-envisioning the Wisconsin Uprising is what we're up to, whether we realize it or not. The Sing Along is an effective answer to those who cry “Educate! Agitate! Organize!” We learn from and educate each other in the song lyrics we write and rewrite and in the announcements we make between songs. Chief Erwin's crackdown is a pretty good indication that we're successfully agitating. And the ease with which we make friends and fortify our connections with each other at the Sing Along is a strong indicator that there's a lot of organizing going on. Something magical happens when we sing. It knits our hearts together and strengthens our resolve. It builds community. Since the disaster visited upon Wisconsin on June 5 of this year, singing together has helped to heal broken hearts, stir up flagging spirits, and refocus energies. Given the communal nature of what we do, I asked the citizen singers why they sing and got some amazing responses, which were so good that it seems right to just share them rather than attempt to distill and paraphrase them. Estonia finally won its freedom following the 1987–1991 Singing Revolution, in which Estonians gathered night after night, singing national songs and hymns banned by the Soviets and listening to rock music. When the Soviets attempted to quell the revolution, the Estonians used their bodies to shield radio and TV stations from being attacked by tanks. The revolution ended without any bloodshed, with one-fifth of the population having participated at some point. It marks one of the greatest triumphs of the power of liberty over authoritarianism in history. If singing together can drive out the foreign occupier, what can it do in Wisconsin? Our communal singing is a cauldron of creative, collective empowerment potent enough to make tyrants tremble. 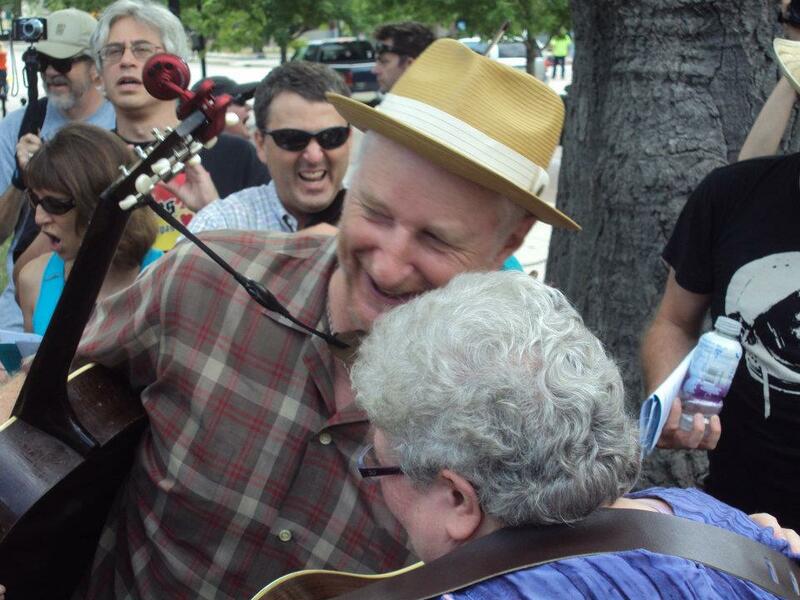 Another citizen singer recommended an article by Solidarity Sing Along friend Billy Bragg about Norwegians singing the song “Children of the Rainbow” in response to the mass killings by Anders Breivik this past spring. Singing a song together is a powerful social experience, as anyone who has ever been to a rock concert can testify. However, if the song you are singing is not just a celebration of love, if the lyric seeks to make a point to people that you consider to be the opposition, then the sense of bonding is heightened. Think of a football crowd whose team have just taken the lead singing in unison a song aimed at their rivals. 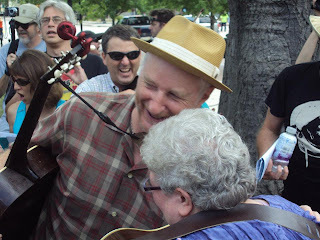 Billy Bragg visited the Solidarity Sing Along on July 10, 2012. In response to my query about why we sing, one participant posted the lyrics to a song by American songwriter and political activist Malvina Reynolds called—oddly enough—“Sing Along.” Makes perfect sense when you think about it. This is the language we use to speak to each other. 'Cause I'm awf'ly nervous lonesome, but I'm swell when I'm a crowd. And just sing "la la la la la" if you don't know the song. 'Cause when we sing together we'll be heard. Cause I'm awf'ly nervous lonesome but I make a fine committee. With a hundred thousand signatures why even he can read. I'm an awful nothing by myself but I'm okay with you. Callen Harty: [Singing in the Capitol] is a way to remind the legislators and the general population that there are still many citizens unhappy over the direction of the state. ... It is a joyous and peaceful way to protest. Instead of yelling at enemies, instead of physical violence, instead of anything negative, it is a positive and beautiful way to find community and to share hurt and hope in a constructive and creative way. ... Singing is a peaceful and joyous way to express what's in our hearts. ♦ ♦ ♦Kimberly Sprecher: I sing because it helps to relieve frustration. It is an outlet for our voices to be heard when no one is listening! Chaous Riddle: I sing because it not only is a very peaceful way to protest, but it also helps vent the anger and frustration that builds up every day. And you feel like your voice is finally being heard. We know they are not listening, but you do know they hear us. Chants can easily be ignored, but singing and music cannot. ♦ ♦ ♦Chris Taylor: Sounds silly, but one reason is (not the most important) It helps my sinus allergy symptoms. Singing is good for my health. ♦ ♦ ♦Joanne Juhnke: Singing is transcendent, collective, joyful. Singing lifts us beyond our individual selves and reminds us how much we need one another. Singing brings an element of peace to a situation fraught with conflict. When we join to sing the harmonies of "Solidarity Forever," we're a peaceful choir, in no danger whatsoever of becoming a mob. Song makes us strong, in ways that Walker and Huebsch and Erwin do not comprehend. ♦ ♦ ♦Sue Breckenridge: I'm really shy, so singing with a group gives me the opportunity to express myself alongside others of like mind. Just coming to the Capitol and standing on the floor with others is actually a pretty big step out of my usual comfort zone. I don't have a great voice myself, but when you're with a group, it all sounds good. Paula Mohan: Singing means creating community by taking part in an activity in which each person contributes and we create something beautiful. I think we all feel better after we participate in a sing-along. So much positive energy comes from it—it uplifts us all. Music is one way to express peace and peaceful intent—and it can create trust and sometimes sway people to your point of view. Songs tell stories too. My companion singers automatically become part of me and, I believe, I become part of them as our voices join and blend, creating community and connection. ... It boils down, at times, to a very simple equation for me: when I am singing in peace and love with my companion singers, completely befuddling the people with guns and power who can't figure out what to do with us, how can I keep from singing? ♦ ♦ ♦Brooke Nicole: I have not participated in the singing, but ... no matter what language and no matter what country and no matter what human cause, singing together conveys peace and power. Not many actions can carry those two messages simultaneously. Singing like you all do is a powerful display of togetherness and organization, of rationality and emotion. It is a way to make your message heard in a way that is virtually unable to be criticized successfully. Anyone threatened by singing is suspect in most cultures. Sure, you can demonize someone holding a sign and shouting, but trying to demonize someone making beautiful noise is rarely effective. It is an avenue of communication which most people cherish. 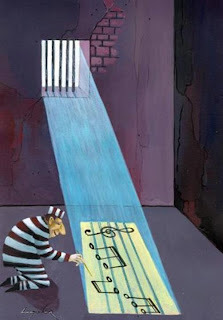 Music is a protective shell for powerful messages. It is the thread of humanity on display, and I, for one, am so thankful for every single day that the Solidarity Singers do it. ♦ ♦ ♦Felix Bunke: Music and song have played a huge role in political and social movements throughout history as a way to convey the message, lift spirits, and build bonds within the group. Woody Guthrie's famous saying on his guitar, "This machine kills fascists," testifies that song is a way to communicate with people who don't necessarily read, and it spreads the message that way. Of course, there's also the proud Wobbly (Industrial Workers of the World, or IWW) tradition of song, especially with the famous "little red songbooks," many of which (including "Solidarity Forever") are rewritten lyrics for tunes that the Salvation Army would play when they were trying to drown out Wobblies while they were “soapboxing," trying to talk with workers and organize—so, with the new lyrics, they were still able to be heard, as they sung the lyrics along with the Salvation Army's "accompaniment"! The IWW have played a huge role in the struggle for freedom of speech, freedom of assembly, and freedom of association. ♦ ♦ ♦Matthew Schauenburg: Singing is a good way to expend energy in a positive and peaceful way, as opposed to just strangling the heck out of Walker. Margit Moses: I sing because it saves my sanity to know that there are others who care passionately about what has been done to us. My office is quite progressive, on the whole, but the general attitude is that the pendulum swings, and swings back. I want to grab that pendulum and make it swing back. So I sing. It may be a very small thing, but I do believe that we matter. Every added body, every voice, makes some difference. Sing on . . .
♦ ♦ ♦Vicki Lee Solomon-Mcclain: Singing is good for calming the soul and reminding us that everything will be all right someday, even if it doesn't feel right now. A pamphlet, no matter how good, is never read more than once. But a song is learned by heart and repeated over and over. Throughout history the arts have always bloomed during times of strife and struggle, and our time is no different. The joyful and creative "noise" of song brings people of all walks of life together in a peaceful, compassionate action when they might not otherwise participate in a more forceful protest. 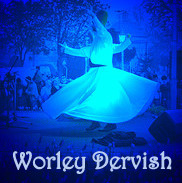 Music is a common language and understood by every culture. Poets show us a way to reach the attention of power via our consciences, hearts, and souls instead of more challenging, direct, and often, confrontational, action. When a singer shares their voice, a different level of unity prevails, and joined voices do speak fearlessly to power. ♦ ♦ ♦Callen Harty: We humans like to sing. There is an elemental draw to joining together in song, and music has been part of protests for as long as there have been protests. Those in power know how dangerous art can be, and they do what they can to quash it. But the Solidarity Sing Along will not be moved. They will not stop carrying their message directly to the heart of our government. The singers know that music can move the masses. It can convey a message in ways that nothing else can. It can get a message through to hardened hearts in a way that simple words cannot. ♦ ♦ ♦Anonymous: We sing to express our humanity. ♦ ♦ ♦Linda Roberson: We sing to witness. We are the embodiment of human decency in Wisconsin: the people who respect the right of all citizens to enjoy basic freedoms and have access to food, education, and health care so they can be productive members of a just society. We sing to celebrate the creative and progressive spirit that characterizes Wisconsin citizens. We sing so that the people in power will never forget that we are here and we cannot be silenced. Thomas J. Mertz: Some of my earliest memories are from early 1960s Open Housing marches and the freedom songs were part of that. Prior to the occupation, and the Solidarity Sings, it wasn't very often that those memories of song and community were refreshed. Now, there is a chance five days a week. I know many, but not all of the regular singers, but who knows who doesn't matter, because when singing together the many are one. Over the last year+ I would try to come by and sing two to three times a month. It always lifted the spirit up. Since the recent crackdown, I've been singing two to three a week. I think the Solidarity Sing Along and what it is creating are important in ways that I'm not sure we'll understand until years from now. Meanwhile, I feel good about being among the creators. ♦ ♦ ♦Linda Rolnick: Singing brings up memories of the civil rights movement, when the protesters and demonstrators would sing as part of their action. Singing has a long action history that goes back to slavery as a way of giving voice to what is in your heart, but in a manner that is often accepted as civil. That is why I sing. ♦ ♦ ♦Susan Cohen: I self-medicate with songs when ever I feel down. I sing because it makes me feel good; there is lots of positive energy in a group sing. There is a sense of shared purpose and an egalitarian-type negotiation that happens when people sing in a group. ♦ ♦ ♦Anonymous: I sing because it keeps me sane (mostly, I think.) And because it's fun! During the first Gulf War, when we were living near Delavan, we used to drive up to Madison for war protests. One time, a small group left our signs at the door, as the police politely requested (those were the days, my friends! ), and had a moment of silence inside, on the first floor. One woman began singing "We Shall Overcome” spontaneously (you paying attention, Dave? ), all dozen or so of us joined in. One day in about March 2011, marching around Our House like I owned it (Dave? ), I heard "Gentle People." I went back to the rotunda, and started singing along. No one stopped me, or asked for my permit. A couple smiles. Sometimes you'll still see me getting a little leaky around the eyes when we sing that one. It's good exercise. It's a nice anchor to the retired days when I'm not working out of town. But most of all, besides bringing cherished memories to life, It's all of you. Rick Rumpel: I'm from Watertown, and Linda and I make the Sing Along when we can. Singing makes our hearts soar. Sort of like a Red Heart Helium Balloon. We come to sing because the people's work is not over. ♦ ♦ ♦Wendi Kent: My husband and I chose his offer from UW Madison because we knew we wanted to start a family. Great schools, his starting package, and safety were our priorities. We found out we were pregnant six days after we moved here. At four months pregnant, the primary reasons we decided to make Madison our home were trampled. We learned of pay cuts before he had even started teaching, insurance co-pay increases before we'd even begun to use it, millions of dollars in cuts to schools, and more. The anger I felt, that we had been "tricked" into accepting the position here over others, was immense. I felt helpless for nine more months during the pregnancy and recovery. It felt terrible. I hated that feeling and I still have that feeling some today, but singing, when we can make it, is the greatest way to feel like I am not completely helpless. I have a voice in the rotunda. Walker might not listen to it, but at least he has to hear it. ♦ ♦ ♦Tom Robson: Although we don't get down there often anymore (we're planning to be there on Friday), being a part of the singers has been therapy. During the worst of the worst times in this war, standing with "our people" with tears in our eyes, singing at the top of our voices (because nobody cares how bad I am), gave us strength and a feeling of oneness during times that this administration was trying so hard to divide us. As Mary Ellen said, I often get one of the songs we sing "stuck in my head," and instead of the usual frustration trying to get a song out of my head, it gives me a feeling of unity with all you guys, wherever I may be. ♦ ♦ ♦Anonymous: I sing because I believe that the energy we put out in the universe by singing does have a positive effect on the causes we sing about. It keeps the energy moving in a way nothing else can. 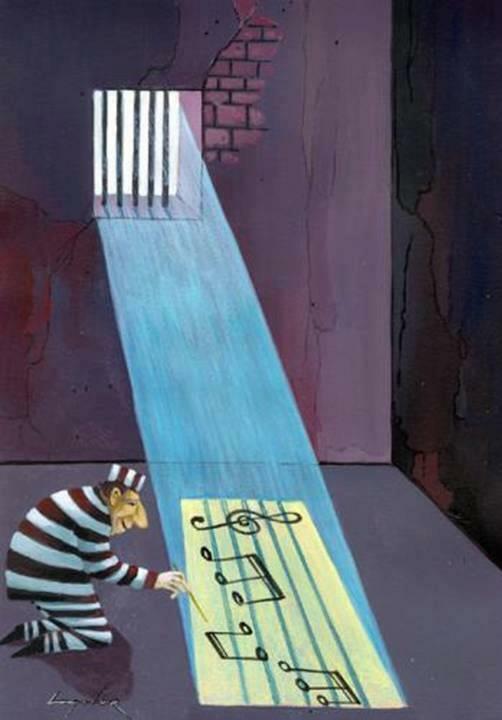 ♦ ♦ ♦Anonymous: I sing because singing is more powerful than yelling. I sing because it's hard to sing and cry at the same time. I sing because it is a magical thing that happens when people stand on the diamonds in the floor of the rotunda. I sing because even one voice in our Capitol is powerful, and hundreds together can be heard throughout the building. I sing because I love the people I sing with. I sing because I believe it's working. ♦ ♦ ♦Mary Watrud: I sing so my children will be enjoying their freedom of speech long after I am gone. I sing because nothing is more therapeutic than singing your guts out for an hour in the middle of the day with dedicated, thoughtful, inspiring, creative people. I've been "singing for my life" since last winter, and now I see my Solidarity Sing Along brothers and sisters everywhere I go. That has had a positive effect on my life—a constant reminder that the good people of the Sing Along are everywhere you look. ♦ ♦ ♦Ella Fitzgerald: The only thing better than singing is more singing. Thanks to Classical Music Humor for the above image, and thanks to Rebecca Kemble for bringing it to my attention. Callen Harty: I sing because the spirit moves me. I sing for those who have no voice. I sing so those in power hear the people who give them power. I sing because I have a song. I sing because I have words and notes to share. I sing to open myself to the heavens. I sing to hear echoes of justice. I sing to taste the sound of freedom on my tongue. I sing for the love of my brothers and sisters. I sing because I must. I sing a song of love. ♦ ♦ ♦Arlo Guthrie: If you want to end war and stuff, you gotta sing loud. ♦ ♦ ♦Come sing with us! Weekdays from noon until 1pm. Mondays through Thursdays, unless there's a scheduled event, we sing in the Capitol rotunda. On Fridays we sing outside the Capitol, by what has come to be known as the Solidarity Tree (on Carroll Street, just southeast of the Lady Forward statue at the intersection of Mifflin, State, and Carroll Streets). Come celebrate with us! On Monday, November 5, we'll be celebrating our 500th Solidarity Sing Along at 7pm at the High Noon Saloon (701A E. Washington Ave. in Madison). If you'd like a copy of the Solidarity Sing Along songbook, you can request one by sending a message to the Solidarity Sing Along Facebook page. 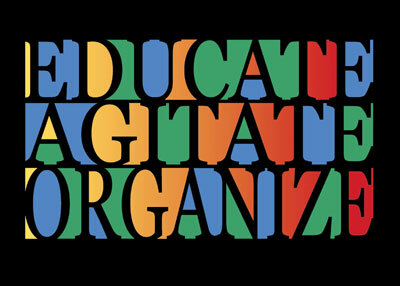 # # #"Educate Agitate Organize" by Ricardo Levins Morales. 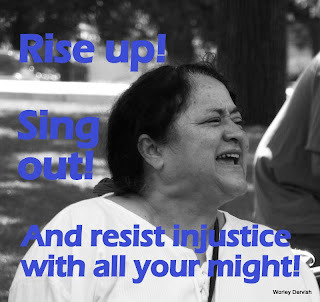 "Rise Up" photo by Erica Case, with added text by Worley Dervish.